Only in the past decade or so I dedicated more time to study psychology to complement scientific analysis from first principles. It allows a better understanding of market forces: psychology in the short term, fundamentals in the long. And yet the crypto cheerleaders will continue to argue BitCoin’s utility as money or a store of value. 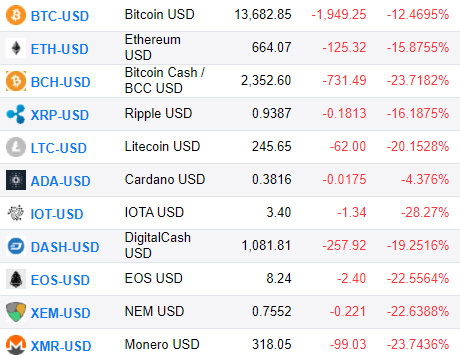 When it takes multiple days to transact with BitCoin (BitCoin’s Lightning Network will only make it worse) and your currency has double-digit percentage variance from day-to-day, clearly the whole “money and store of value” spiel is a psychological play and nothing to do with facts or fundamentals. Talking heads like Peter Van Valkenburgh like to yell buzzwords in debates to give the illusion of authority and expertise and to also prevent logical rebuttal from entering the discussion. This is a common persuasive tactic to rope in those that react emotionally rather than take a step back to see potential problems with what is being said. Combine the buzzword onslaught with the condescending “you don’t understand” lines from the mob and you can see why the average person will want to side with the self-proclaimed crypto-intelligensia to avoid more negative feelings (and perhaps gain the high ground to dish out those same insults on their own). One of Valkenburgh’s favourite buzzwords is the double-spending problem. Double-spending occurs when any transaction happens twice with the same “id”. Take debit cards for example. You wouldn’t want the card holder to be able to pay for two separate items in two separate transactions using the same $5 he has in his bank account. By identifying each transaction uniquely you can guarantee that the $5 won’t be spent twice. For centralized servers, this simply doesn’t happen as long as the server validates the transaction to ensure every “id” is unique. In the decentralized scenario, blockchain becomes the distributed approach to guaranteeing uniqueness. Everyone on the payment network knows about the transaction. This is the “breakthrough” that is supposed to send BitCoin to the moon. Software’s replicability is what leads to the scarcity paradox with cryptocurrencies. You can’t produce scarcity with software, but you can make things plentiful. Sure, you can enforce scarcity, just like World of Warcraft can just limit the supply of gold in its game, and how BitCoin can limit its supply at 21,000,000 coins, but can you enforce a limit on the number of future World of Warcraft versions (or any economy based video game) or the number of versions and variants of BitCoin, in order to maintain their stores of value? I don’t care about what blockchain does or can do in either instance. You can solve the double-spending problem all you want but outside of a video game scenario to prevent cheating, it simply cannot be scarce and of real-life value when it will always be replicable simply by being software. It’s just as bad as fiat currency, perhaps worse, because software can be reproduced and iterated instantaneously, shrinking the time frame when hyperinflation and obsolescence occurs. Peter Van Valkenburgh continues to score own-goals by arguing that money laundering and black market spending is prevented since every transaction is publicly known on the blockchain. How is this at all a selling point for BitCoin? Rather than touting its main benefits of decentralization and avoiding state-control, the fact that everything is documented is inferring that your privacy is gone, subject to big brother’s monitoring of your every move. The worst part is that not only can the government track your spending habits, so can anyone else! BitCoin can’t have the best of both worlds. Monero at least makes an attempt to achieve anonymity on its blockchain implementation and makes the honest concession that it can be used in the dark web. Rather than go into the fundamental analysis on the effectiveness of hashgraph, I just wanted to address it from a psychological perspective. Hashgraph will be “version 2.0” of the distribution algorithm used by cryptocurrencies. It is “n+1”, where n can approach infinity, as aforementioned in the “double-spending” section. In other words, if there exists n+1, then n will be obsolete, and it’s a matter of time (a short period of time in the computing world) where n+2 comes along and makes n+1 obsolete. The successor to hashgraph, hashgraph+1 or blockchain+2, will drive the value of all out-dated cryptocurrencies to zero. This is relatively easy to understand from a lay-person’s perspective and could be the psychological death blow to cryptocurrencies. Just as people realize how worthless their iPhone 3 is relative to the iPhone X, BitCoin will be a distant memory relative to future hashgraph coins. Not only is this survivor bias at work (nitpicking a few successes and ignoring the thousands of failures), this is ignoring the scale of tech companies versus the scale of development required to create a cryptocurrency. How is anyone certain that Facebook will still be alive five years from now, or even by next year? In fact with all the faults of Facebook and their complete lack of technological innovation (I will credit them with innovation in psychological manipulation), I suspect they will be obsolete soon, eclipsed by a new fad that will make social media more embarrassing to use than it is today. Companies come and go, just along a much longer time scale. Unless they adapt, they usually fall by the wayside while leaner, agile more innovative companies become the new leaders. New cryptocurrencies are being churned out at a much faster rate than new tech companies. The manpower required to create, launch and maintain a cryptocurrency is generally small relative to say, creating, launching and maintaining a giant online retailer like Amazon. Additionally, cryptocurrencies have scalability problems when the number of users grow. Furthermore, the emerging field of quantum computing and algorithms in brute-force hacking such as Shor’s algorithm will wreak havoc on all cryptocurrencies using outdated cryptography. A cryptocurrency’s life span is very short given the ease of creating new cryptocurrencies combined with future scalability and security problems. It becomes incredibly difficult to adapt and be agile if it requires updating millions of clients while maintaining backwards compatibility. It should be evident that the attrition rate with cryptocurrencies is much higher than what you would see with businesses. Sure, BitCoin is like Facebook. It will just be like Facebook when Facebook also goes to $0. 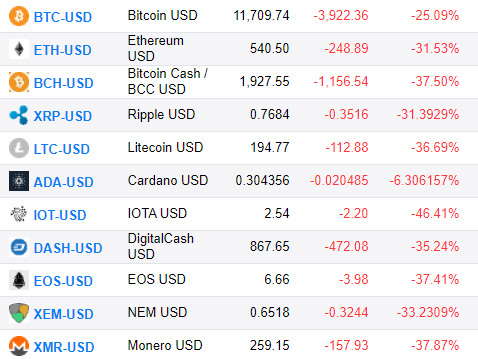 And during the time it took to write this article, cryptos drop another 10% — how’s that considered a stable “store of value”? If there’s any air left in this bubble, you can partake in the frenzy by elevating your electricity bill and mining Monero. Check out my guide. If you liked this article, or if you disagree and dare to say “you don’t understand cryptocurrencies”, leave a comment, share with your echo chamber, and subscribe to my RSS screed feed. Consider a donation (XMR welcome!) and take a look at my other work. When’s it gonna crash so I can enjoy the show?